Works fine when I try. full version with lots of extras. 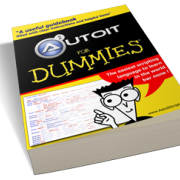 That would mean that you have the "lite version" that comes with the "production install" of AutoIt3. My point being - the problem that the OP documented only happens with the full version. This is an issue with the LUA function that tries to fix the SciTE indentation which only comes with the FULL version. I know it has come up before and Valik had a look at it (he wrote that LUA function) .. Thanks for the info. It is not much of a problem for me. I was just confirming the first post and clarifying the second one. Thanks to all that have put so much into the SciTE4AutoIt3 tool. The problem occurs when the line before EndSwitch is an empty line. If I remember, it's hard to fix this problem which is why it's not fixed.